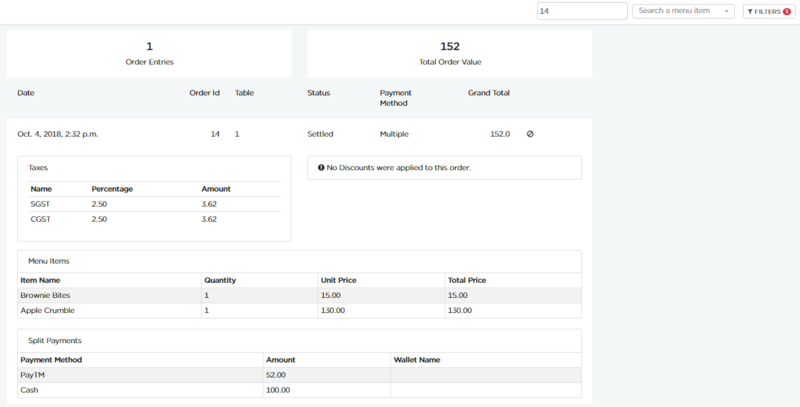 POS application is synced with Eagleowl and you can view the orders recorded in ORDERS page. Go to POS -> ORDERS or Click here to view the orders list. As shown in above example, you can see all the order entries and their total value. A quick view of each order can be checked by clicking on that specific order. As shown in above example, you get the details of ordered items, tax and discounts applied on that specific order. 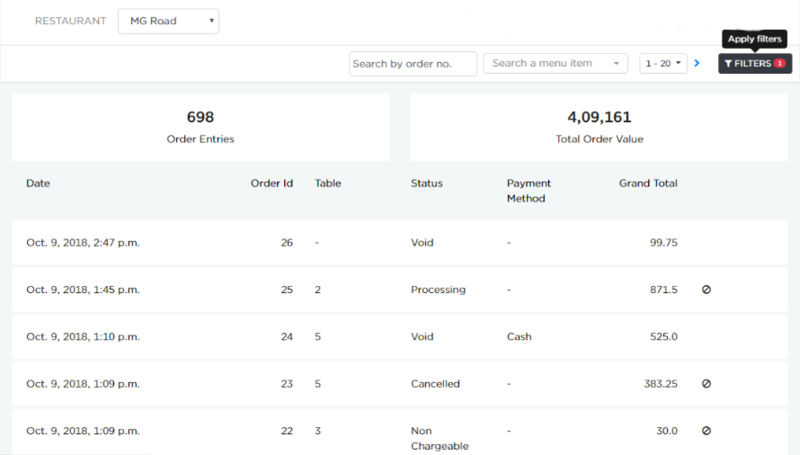 Search tabs are used to search orders by order numbers/Id and also by menu items. Each order will have a specific Id and these numbers can be used to check the status of orders. Consider, you need to check the "order 14" status and details. And you can click on the order to get a quick view of the specific order. You can also search for an item present in the above mentioned order. As shown in above example, "Brownie Bites" is searched and it is highlighted in the order. This is done to check the sales of a particular item in a selected date range. Consider, you want to check the sales of "Brownie Bites" in last 30 days. 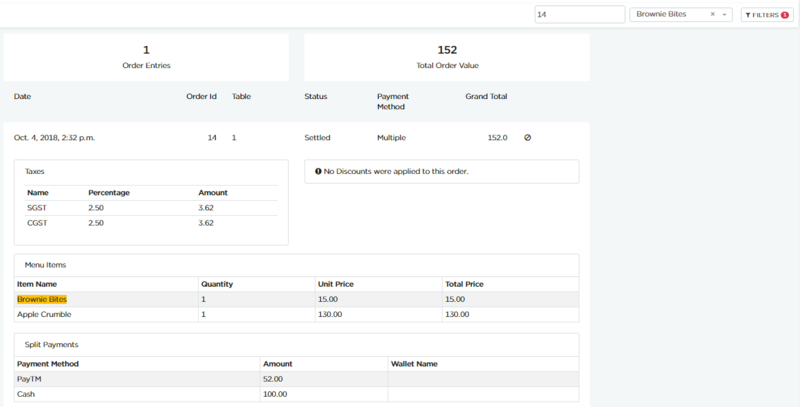 As shown in above example, "9 orders" were placed for "Brownie Bites"
In the context of POS , the term void is a complete deletion of transactions of ongoing or settled orders. Click on Void icon to void the order. Now you can see the above order is voided. In a similar way even processing order can be voided. 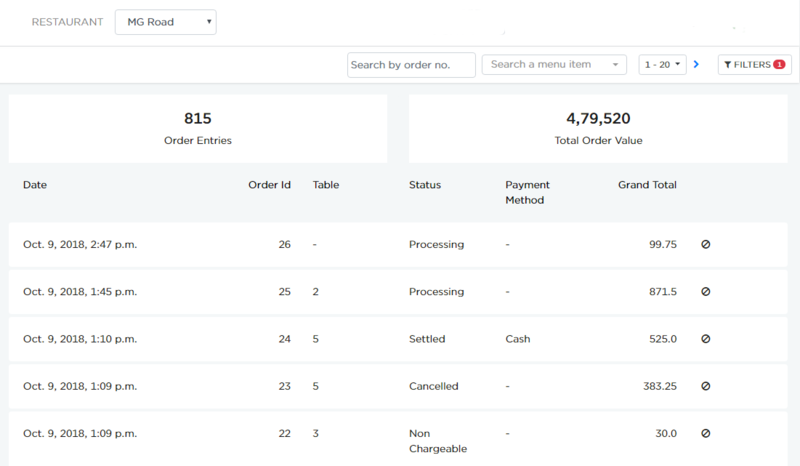 Filters button is used to filter the listed orders based on applicable categories. 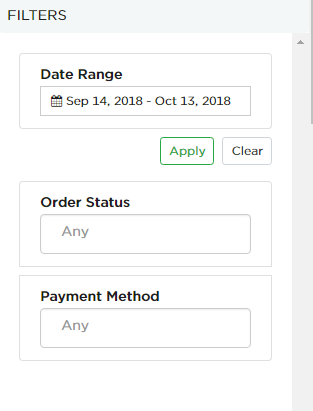 Select the date range and categories from the dropdown and click Apply button to see the orders that fall under the selected category.